Yes we do! Each staff member you meet at SEA LIFE Birmingham will have two Pop Badges on their lanyard. They are able to swap any of your spares with you. Be considerate of other people’s collections and do not pressure them to swap something they may want to hold onto for their personal collection. Staff love to swap their pop badges, however if they are occupying a ride or feeding our creatures there may be a small delay in swapping.  Collectors are responsible for their personal collection of pop badges and SEA LIFE Birmingham cannot be held accountable for any losses that may occur on the premises. For fair swapping, our pop badge policy is 1 badge for 1 badge per swap, regardless of the Pop Badge’s status or rarity. Pop Badges are NOT for resale and hold no value. Do not pay someone for Pop Badges as they are making unlawful profit from the centre's intellectual property.